An affordable e-bicycle with enough power to make it suitable for commutes and long distance rides. Lightspeed is an Electric Mobility Solutions company based in India that makes Electric Bicycles for a fun experience in Urban Environments. Their bicycles have been gaining interest since their launch in the second half of 2017. The brand houses three electric bicycles in their current portfolio. We got to review the Lightspeed Glyd 7 Speed and here is what sparked our interest. The Lightspeed Glyd 7 speed is made using an Alloy hardtail frame. While the previous version were in steel, the alloy frame helps with reducing the weight of the bicycle. This alloy frame material, makes it a sturdy and durable bicycle capable of withstanding heavy usage. The bicycle comes in a single frame size corresponding to 18.5”. This is suitable for riders from 5’5” to 6’ tall. The bicycle comes with a suspension fork which works well to absorb vibrations felt from flat terrain trails as well as rugged roads and potholes. The Lightspeed Glyd 7 Speed comes with a Black frame, with Orange highlights. The branding is in the same shade of Orange. The rims on the bicycle are color coded, and match the shade of Orange that is on the frame.In addition to its neat design and paint job, the front LED lights and display monitor add to the overall aesthetic appeal of this bicycle. Lightspeed have recently come out with geared variants of the Glyd. The bicycle which I test rode came with a 1x7 Speed Shimano Tourney SIS rear derailleur. Gears in an electric bicycle help in keeping up to the battery assist speed of the bicycle by adjusting the pressure applied in pedaling. These gears are also useful when the battery charge is low or if the charge has run out, as one can use it to ride efficiently. The Battery and Motor is the make or break of electric bicycles. 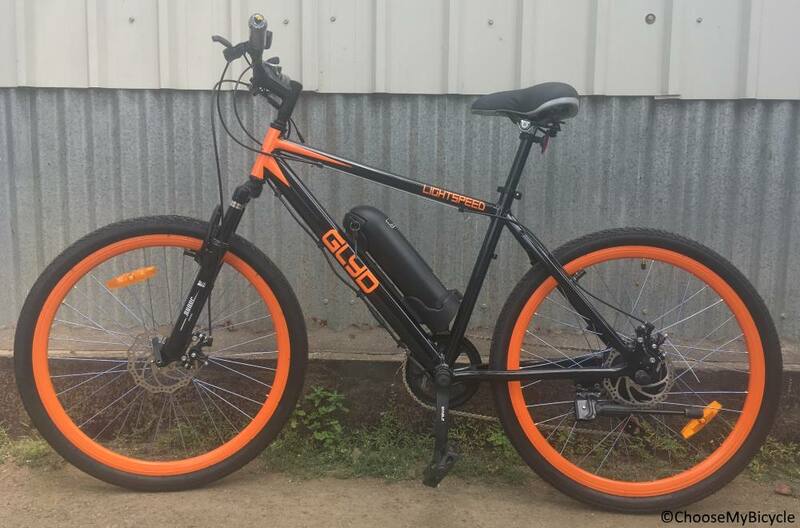 The Lightspeed Glyd 7 Speed comes with a 250W brushless DC motor located at the hub of the rear wheel which is powered by a rechargeable Lithium Ion battery, with a capacity of 7.8Ah. The battery takes about 3.5 hours to charge and can last for an approximate of 30-35 kilometres per charge. This is probably the only area that could use with a slight upgrade on this bicycle. The bicycle functions on two operating modes, one being pedal-assist and the second being hub, and throttle driven. In the pedal-assist mode, there are three levels - Low, Medium and High - each determining the amount of momentum provided by the pedal assist system. The Low mode being the least, and High mode being the most. The ‘High’ setting allowed me to reach 25 kmph with minimum effort. In the second mode, one achieves additional momentum by simply moving the throttle on the right grip of the handlebar, similar to the accelerator on scooters. The maximum speed achievable on this mode is also 25 kmph, however using this mode one does not have to pedal, at all. Thereby, saving energy. The pick up was rather impressive while using both modes, and the power is sufficient to effortlessly conquer climbs and harsh ‘head wind’ riding conditions. The Lightspeed Glyd 7 Speed comes with a Disc brake at the front and a V-Brake at the back. Since electric bicycles deliver speeds that require no effort, braking is an important component, incase one needs to get the bicycle to a full stop within moments. The brakes on this bicycle worked efficiently, giving me confidence to ride without inhibitions in heavy city traffic. The right brake also acts as a motor cut off, and responds quickly. The handlebar on this bicycle is long and comfortable, allowing for a comfortable riding position. The reach to the display monitor on the left, and the accelerator on the right was well spaced, allowing comfortable access without straining at all while riding. The Lightspeed Glyd 7 Speed comes with Ralson 26” x 1.95”, well treaded tires. The 1.95” width of the tires enabled that they were fast rolling and has good grip. 26” tires are great in terms of on-road performance with the likelihood of potholes and occasional rough and rugged roads. The tires are sure to work well providing adequate traction on both wet and dry surfaces. The Saddle on this bicycle is commendable. It was well cushioned throughout, leaving no room for saddle sores or general discomfort when used on longer rides. 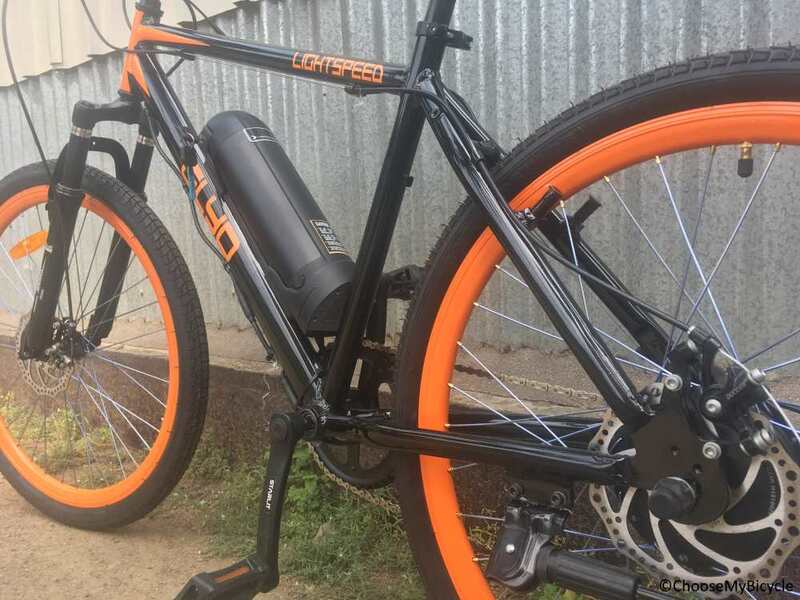 The Lightspeed Glyd 7 speed is the perfect choice for environmental and health conscious individuals, looking to reduce their carbon footprint while opting for a healthy lifestyle. The bicycle enables one to have an effortless commute as well as use the pedal assist option and get in some exercise. Priced at Rs.35,998 (as on 8th February 2019) it is a perfect bicycle for people looking for an affordable, performance focused hybrid electric bicycle for commutes and weekend rides.